Q: Why do people do the things they do? A: People do the things they do to get what they need. Through the nearly 30 years since, we introduced this simple explanation of human behavior, it has stuck with me. Yes, we humans are super complex, and it’s dangerous to try and fit the wonder of human behavior into such a simple construct. But, I keep coming back to the same, apparently inevitable conclusion. We humans do what we do to get what we need. TRE was recognized as a 2018 Gazette Best Place to Work. This follows the same honor in 2017, which came on the heels of being named a 2016 When Work Works Award Winner, a national honor bestowed on TRE by the Families and Work Institute (FWI) and the Society for Human Resource Management (SHRM). While we are proud of the recognition, we are deeply humbled by what the honors represent. They come directly from input from TRE staff, who respond to anonymous surveys about company culture, quality of leadership, whether or not they feel meaningfully supported, and the like. 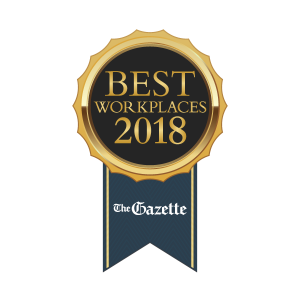 I’m happy to share data from 2017 and 2018 Gazette Best Place to Work surveys, below. As I’ve shared this data with TRE Leadership and Board, and now you, I’ve noted areas to celebrate and areas to improve, and I’ve urged all of us to study not just the numbers but to dig into what they mean. TRE’s turnover rate has tended, over the past four years at between 22% and 27%. Against industry standards that range from as low as 33% to as high as 54% (and, for direct support professionals, as high as 70%! ), our turnover rate is relatively low. We also analyze the reasons people do choose to leave us. 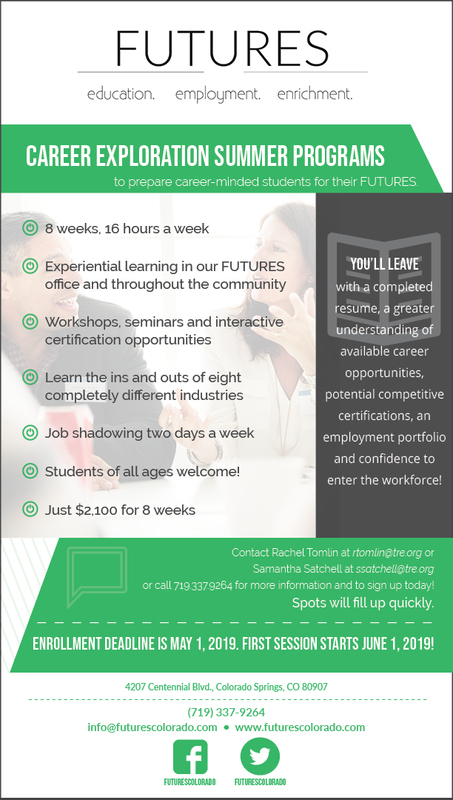 For example, of the 37 people who have left TRE during fiscal year 2019, nearly 70% of them have left because of moves out of Colorado, or because they are returning to graduate school, or because they are turning their attention to different priorities, like family or new careers or the like. In other words, these wonderful, talented people leave TRE for what we consider the ‘right’ reasons. With that said, 30% of the 37 people who have left TRE during the current fiscal year have left because they are dissatisfied with the work, with the stress and yes, with TRE itself. On the flip side of these numbers, I am inspired by the 73% to nearly 80% of TRE staff who stay. Despite the high stress that comes with any human service work, pay rates that just don’t keep pace with other industries and industry sectors, and heavy workloads, nearly 8 out of every 10 TRE employees stay. So, back to my human behavior theory and my belief that we humans do what we do to get what we need, what does all this mean for TRE and for our magnificent staff? Check out the data below, which is a reflection of questions asked of TRE staff in the Gazette Best Workplaces survey and our staffs’ responses (the Likert scale is 1-7, where seven is the highest level of agreement with the statement and one is the highest level of disagreement with the statement). Staff tell us that they believe we’re going in the right direction, that we operate by strong values and ethics, that we encourage different points of view, that they have the flexibility they need to seek work/life balance, that we are socially responsible as a company. They tell us that they believe we care about them, we seek ways to nurture their growth, and that we support them reaching their potential. They also tell us that we have work to do in expressing our appreciation for their hard work, in keeping everyone informed around decisions being made at the agency, in providing meaningful training and support as we try to learn our jobs, and in addressing fair pay and benefits for the size and expectations of the jobs we do. All of this offers some critical insight into understanding why people leave TRE and why people stay. People leave TRE, overwhelmingly, to turn toward family, to new opportunities, and to fulfill their own life’s missions. They do what they do (leave TRE) to get what they need (greater connection to what they know most fulfills them). Even those who leave out of dissatisfaction with the work or with TRE as a workplace are doing what they do (leaving) to get what they need (more peace of mind, less stress, for example)! The staff that stay do so not nearly as much because of the pay and the benefits (as demonstrated in the data from the Best Workplaces survey), but for higher purposes. They stay because TRE’s work and our culture fulfills them—because of the profound privilege we all treasure of working alongside fellow humans, because of TRE’s culture of commitment to and concern for them as colleagues, because TRE offers them the chance to express themselves and their talent, to grow and to flourish. All of this brings me to this point: For TRE to be a professional home for the field’s best talent, we must continue to provide the things that people need in a workplace—a rich culture, lots of authentic support, genuinely committed and caring leadership, a mission and values that match with staff’s own values… these are all essential needs that people need to feel fulfilled and challenged and valued in a workplace. And, when we do what we do and get what we need by doing it, we humans tend to do it more and do it better. For no specific reason, and on no particular occasion other than ‘just because,’ I hope you’ll join me in thanking the 360 or so staff who have chosen TRE as their professional home for the work they do. Ours is hard work. We have the great honor of working with our fellow human beings. While the joys that come with this work are abundant, so too is the stress that inevitably comes with it. I’d not trade this work for any other, and to a person, neither would our staff. They earn and deserve my gratitude each and every day, and I hope you’ll join me in thanking them for doing what they do. I recently had the chance to spend time in Boston, Massachusetts. What a great city. When you fly into Boston, depending on winds, you fly smack dab toward the city’s skyline and touch down on runway 33L. I had the good luck of flying in, most recently, at night, so the skyline was lit up so magnificently it took my breath away. It’s made me think about what we humans contemplate as beautiful. My friend, Rick Guidotti, tells the story of his transformation from a high fashion photographer (see his bio at https://positiveexposure.org/about-the-program-2/rick-guidotti/, and while you’re there, check out Positive Exposure). As the story goes, Rick had it all. He was at the pinnacle of his profession, taking pictures of the planet’s super models, jetting around the world to exotic places for photo shoots. These super models are how the world of fashion defines beauty. And the men and women of high fashion who grace our magazine covers are, well, they’re gorgeous. By someone’s definition. But Rick came to a point where he decided that HE wanted to decide what is beautiful, and that by way of only the slightest effort in looking beyond the traditional trappings of beauty, you can find it in anyone. In everyone. So was born Positive Exposure. Rick and Positive Exposure have partnered with The Resource Exchange for years, now, to present a rich world of abiding beauty, and it has changed us forever. My son, Jakob, is in a band. They’re beyond being a high school band, and they were never a ‘garage band.’ They write, play, produce and distribute their music. They’re good. Really good. Their style is what I call folk rock fusion. In a single song, they might remind you of Simon and Garfunkel, and in the next stanza, of Coldplay. Setting my (considerable) bias aside, I think they’re fabulous. For others, the band (Richy Mitch and the Coal Miners) are just not their cup of tea. Some people like heavy metal, while its country for others. Potato, potato; tomato, tomato. I can’t draw, sing, paint or any other creative art my way out of a wet paper bag. When people lined up for creative talent, I must have been asleep. And I have to tell you, it totally bums me out. I want to have creative, artistic talent, I really do. I used to dream of being able to play guitar, or to sing. To really, really be great at singing. I look at fabulous singers, and I just swoon. But nope. I got nothin’. Not even stick figures, whose arms are out of scale, legs too long and heads too huge. What it must be like to paint or to sculpt… the ability to start with tabula rasa, and to breathe life into vision on canvas. If only. Last week, TRE hosted an Art Walk. We had 14 artists featured, every one of whom allows TRE the honor of serving them. We had about 35 folks join us, browsing the art, chatting with the artists, and enjoying the company of others. What I’m embarrassed to admit is that I didn’t expect the evening to turn out quite like it did. Before I get to that, I have a confession. Art, especially visual art, is very much in the eye of the beholder. I look at certain artwork, and honestly, I can’t figure out how or why it’s art. I always put this down to being less cultured that I should be, or too close-minded about such things, but I can’t seem to understand how something over which others are ‘oohing’ and ‘aahing’ is just ‘meh’ to me. That said, the art I do find beautiful, the art that speaks to me, I buy. One of my greatest treasures is a watercolor called Apples, painted by Skye Gault. It was a gift, and it has hung in my office at TRE ever since. It’s gorgeous, and I am in awe of Skye’s talent. 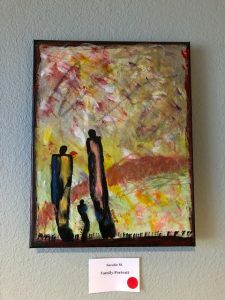 I recently bought a piece—Paradise—by Angel Weis, an original oil on canvas. It’s a piece that just called out to me. I have two of the coolest pieces from the amazing artists whose work is featured at Dream Catchers (check it out here: http://dreamcatcherscos.com/the-studio/), one at the office, the other at home. I have hand-crafted Judaica—chamsot and mezzuzot—from artists in Israel being supported by Israel Elwyn, and Akim and Beit Issie Shapiro. Every piece a part of my expanding collection from a variety of artists. Okay, so back to the Art Walk. I expected a nice evening of chit chat, of some oohing and aahing, enjoying good food and better company. We had that, but wait. There was more. Turns out, artists that night sold six pieces for more than $450. The oohing and aahing was more like “I want”-ing. People connected to the art viscerally. People reacted to the art like we tend to do—not because of the artist, per se, but because we connect with the art itself. Besides, turns out no one cared that the artists happened to have intellectual and developmental disabilities. It was the art that stood on its own. All of this has me thinking. Humans are human. Some of us born with artistic talent, others not. Some of us born with athletic gifts, others not. Some of us more endowed with natural propensity to academic success than others. As I watched these artists connect with the people admiring their work, it occurred to me that they were connecting on a different dimension. These fans of the art and the artists that produced it were connected not by the presence or absence of an intellectual and developmental disability. It was utterly irrelevant. Instead, they were connected by the art. In those moments, the ridiculous labels we use too often and too easily to define our differences were washed away through the media of art, the sculptures and oils, the water colors and pencil drawings. It was, my friends, magnificent. There is timeless, indelible beauty in human connection. It is not characterized by the color of our eyes, the length of our hair, or the straightness of our teeth. It is not found in the labels we use to describe ourselves and others or the sense of charity that too often accompanies the labels. It is, instead, our experience of one another. At a little old Art Walk on the little dot in the universe we occupied that evening. Art patron to artist. The celebration of beauty, not just in the vivid colors of the art, but in an unbridled, decidedly human intersection among about 50 people on that special evening. Ah, healthcare. A simple, calming topic of discussion across the US these days. The reality, instead, is that any discussion of healthcare in the US these days is fraught with uncertainty, concerns about seemingly ever-rising costs, and anxiety about what the future holds. Setting aside ideologically charged (and far too frequently politically-motivated) debates that fuel this national narrative, here are some facts. Total national health expenditures as a percent of Gross Domestic Product has risen by more than 145% since 1970. What’s more, in 2016 the US total health expenditure as a percent of GDP is 44% higher than the second-ranked country (Switzerland). Yet, the average life expectancy of Americans is ranked only 11th highest, at 79 years of age; and, Americans experience the highest mortality rates in the global community. As many of you know, The Resource Exchange pays close attention to the healthcare landscape, paying particularly close attention to Medicaid-financed healthcare. The data in this smaller universe is no less compelling. In a 2001 report from the US Department of Health and Human Services, people with intellectual and developmental disabilities (IDD) represented just about 5% of the Medicaid population, but spent nearly 16% of the total Medicaid expenditures in healthcare. Put in more recent context, a 2018 research study puts Medicaid spending on healthcare for people with IDD at just under $5 billion annually. Yep, billion. With a “B”. So, all this healthcare stuff is, well, a big darn deal. It is not, however, surprising. Did you know that men and women with IDD, on average, experience — brace yourselves — between eight and 14 co-occurring health conditions, like obesity and hypertension, high cholesterol, diabetes, anxiety and depression? With few exceptions, none of these conditions are genetically or physiologically inevitable for people with IDD. What is inevitable is that these conditions — treatable chronic disease, leads to higher mortality rates and lower health-related quality of life owing to lack of access to culturally-competent primary and specialty care. Yet, we know that quality, culturally-competent healthcare produces improvements in health status at a lower cost, and people appear to be living happier lives as a potential result. We also know that there are good things starting to happen to address these challenges. In medical school, we haven’t historically taught to an agreed, clinical standard for adults with IDD. We have no board certification options for medical practitioners who may seek to treat adults with IDD, and we recognize no formal specialty or subspecialty in medicine that speaks to this essential part of our community. But, a small but growing number of US-based medical schools are focusing unprecedented attention on teaching medical students about IDD, common social determinants of health that characterize the life experience of people with IDD and the chronic conditions that tend to accompany them, and teaching medical students how to appropriately interact with people with IDD. Our very own University of Colorado School of Medicine is a national leader, having made substantial curricular additions, starting three years ago, that formalize learning about and from, and working with adults with IDD for medical students (Big ol’ shout out to Drs. Erik Wallace and Heather Cassidy for their leadership in making this happen). Despite these advances, most folks going to medical school don’t automatically think of a career in medicine that focuses on folks with IDD. They’re oftentimes graduating with mountains of debt, and Medicaid-reimbursed healthcare is frankly not lucrative enough to cover the costs of running a practice, paying down hundreds of thousands in school loan debt, and putting food on the table. This, added to the lack of board certification options and the relative lack of attention paid in medical school to IDD, results in very, very, very, very, very few young physicians opting into a career in medicine that focuses on people with IDD. That is, that is, until (maybe) now. A specific benefit is… wait for it… access to loan repayment and training programs in the Health Services and Resources Administration’s Workforce Development and Training Programs including the national Health Service Corps Scholarships. Yep, that’s right. An incentive for medical and other health science students to choose a career — one they can afford — delivering healthcare to people with IDD. Imagine a world in which people with IDD and their families didn’t have to run through an average of 50 physicians in order to find one competent in delivering appropriate and culturally-competent healthcare. Imagine these massive rates of chronic disease, all treatable, being more appropriately addressed through a wider range of healthcare options that are designed with people with IDD in mind. This bill — the HEADs UP Act of 2018 — is a gigantic step in the right direction, and if I’m honest, 20 years in coming. There is still a long road to travel. Congress isn’t quite firing on all cylinders these days, and it’s hard to imagine them picking this up as a priority. You can help. Go to this link: https://www.house.gov/representatives/find-your-representative. Type in your Zip code. Identify your congressperson. Give ‘em a call or send an e-mail. Tell them to support the HEADs UP Act of 2018. Democrat or Republican, doesn’t matter. Maybe, just maybe if enough of us tell them so, they too can do the right thing for the right reason. Social media as a means to welcome curious on-lookers into the magnificent world in which we work. I was born in the 20th Century. Not a big deal, really. Many of us were. My oldest son was too, in 1999. But I was born before there were handheld computers that double as telephones, before there were CDs (no, not certificates of deposit), and before there was any such thing as social media. Facebook, Twitter, Instagram, Snapchat and others have fundamentally altered the way we humans interact with the world. None of them existed back in the good ol’ days… y’know, when humans actually had to—wait for it—talk with one another. But hey, I’m a progressive guy, utterly in touch with all things modern. So, as social media took firm hold, a maven I became. I had profiles on every platform, counted Likes and Shares and Retweets as a measure of how savvy and downright popular I was. Shared details of my life I assumed would be interesting to my ‘friends,’ never pausing long enough to appreciate how completely presumptuous I was. As I was absorbed in the then-novelty of this new-fangled portal to the world, I was late in recognizing the emergence of a whole new dynamic that began to characterize social media. About a hundred years ago, I went to college at The Pennsylvania State University (go Nittany Lions!). I was young, on my own for the first time, and surrounded by a whole bunch of people who were in the exact same situation. I think it’s fair to say we played fast and loose with anything resembling good judgment. One of the things I took notice of was what we came to refer to as ‘Beer Muscles.’ Beer muscles are quite common among young, college-aged males who have discovered beer like the old 49ers discovered California. What are beer muscles? So, imagine these same, thirsty young men whose inhibitions have been stripped by several cans of too-easy-to-access beer. These same, otherwise bright, even polite young men, eager to impress the young ladies in their midst, would engage in feats of strength that were, well, just silly. It’s never a good idea to ‘front’ a bouncer, for example; or, to make idle threats to other, similarly-lubricated young men who fancied the same young ladies. When muscle is only muscle with the benefit of ample supplies of beer, beer muscles are born. It occurs to me we are seeing a similar dynamic with social media. Seated behind the soft glow of a computer screen in the anonymity of a dark room, people can write virtually anything. And so they do, portraying a confidence that isn’t always grounded in fact or even reality. I recently left Facebook, never to return, aghast at the seeming immunity granted to its purveyors who quite frequently and quite happily post things that are just awful! Insults, calling names—bad names, false and baseless accusations. Bullying, by any definition. Beer muscles, but from a far darker place and with far more damaging and lasting impact. I was recently sharing this with my Marketing Director. Turns out, modern marketing relies kinda heavily on social media platforms like Facebook and Twitter and others. She’s right, my Marketing Director. Objectively, I know this. But, how to reconcile this 21st Century tool with my 20th Century roots, where personal contact and traditional media are the tools of marketing? And, what to do about the just plain ol’ bad manners that have become the unfortunate norm in social media? Here’s what I think we do, individually as humans, as professionals and as members of the homo sapien community. We use our manners. We’re polite. We agree with grace and disagree with civility. We invite dialogue and discovery, while rejecting mean-spiritedness and bullying. My mom would have, were she alive in this modern world, told me to lead by example. No preaching, no dictating terms. Be humble, she’d counsel. Create community, nurture relationships. Keep your word and stand up for anyone needing a hand-up. True when I was heading outside with my Tonka trucks, and true today when I head to the digital playground. As an organization, TRE needs to share information, to engage the community it serves and the one of which it is part. We need to advocate and educate, to welcome curious on-lookers into the magnificent world in which we work, to introduce kids and adults with cognitive disabilities to the community which sometimes looks beyond them. We need to share our ideas, test our theories, and stand firm in the unquenchable thirst for the fullest expression of all human rights by all humans. This, I think, is where and how social media fits into my view of the modern world. Old as I may be getting, there are always opportunities to open new doors, to reconsider and re-contemplate new avenues of connecting with the world in which we live. I’m not sure Facebook dialogue will ever replace a good old fashioned conversation in a cozy nook over a cup of coffee or a glass of wine. But hey, this old dog learns new tricks every day. And if I can do it, so can you. I had a pretty fantastic, if brief chat this morning with a co-worker here at TRE. It wasn’t a particularly uplifting chat, but a really important and good one. It was about death and dying. We have, at TRE, the most exquisite privilege of working alongside nearly 5,000 kids and adults and their families across southern Colorado. Among those nearly 5,000 people are infants and toddlers, ‘tweeners’ and teenagers, young adults, middle-aged adults and yes, fabulously enough, seniors. We happen to serve a woman in her 90s, an absolute miracle when considering that at the turn of the 20th Century, the average lifespan of people with intellectual and/or developmental disabilities (IDD) was 19. We’ve come a long way. While people with IDD are indeed living longer than at any point in human history, no one lives forever. Death is inevitable. We know it and we prepare for it. But seemingly no matter the preparation, death is hard. In 1993, my mother (z”l) died at 53 after a battle with cancer. She was diagnosed about 18 months earlier. We knew it was a deadly cancer, and we prepared for the worst. On an otherwise nondescript September morning, having had lots of time to prepare, I got the call. By the time I raced to the hospital, a drive I’d made twice a day in the weeks before to visit her, my mom was gone. For all the preparation, the time to think about what I would do, the planning we’d done, I was utterly crushed. Time does indeed heal all wounds. As these nearly 25 years have gone by, I have healed. My memories are made up of countless images of laughter and love, pride and complete happiness. The pain of her losing battle with cancer has been replaced with deep pride for the courage of her fight. The sense of loss, which never completely goes away, is replaced with a keen sense of her contribution to the world over her 53 years—she actually did what she counseled me to do, making the world better for her journey. Her legacy is defined by the change she brought to her family, her community and her universe. At TRE, we grudgingly acknowledge that the people we support, who invite us to be part of their journey, will grow older and eventually, even as we wish it not to be so, we will lose them. We prepare, we plan; we work with family and friends to make sure arrangements are put in place. We do what TRE does through the lens of service delivery. It’s our job. But, we also grieve. We mourn the loss of people who touched our lives, people who allowed us the honor of a brief glimpse into their dreams and aspirations. And no matter how much preparation and planning we do, no matter how many times we remind ourselves that ours is a ‘professional’ relationship with the people we serve, it’s never enough to relieve us of our grief. The universe is made up of countless stars. As one burns out, another is born, but the universe is changed forever. Some weeks ago, I called a mom whose daughter TRE had served. She’d just passed away… I found myself at a loss for words of any comfort for this mom, who outlives her daughter, surely every parents’ nightmare. Death is hard. And no amount of time prepares us for it. This is as true for all of us in our personal lives as it is true of our professional journeys at TRE. All of us are touched by people alongside whom we have the honor of working, better and richer for the gift of their influence. All of us resist acknowledging the inevitability of death, and when it comes, we are devastated. We struggle through our sense of loss, and we build a treasure trove of memories that sustain the legacy of their impact on our lives. Ironically, this is the lasting gift given us from people with whom we work—their impact on us, an impact that transcends the brevity and context of the relationship. We are stronger, wiser and that much more complete, for which we are forever grateful. 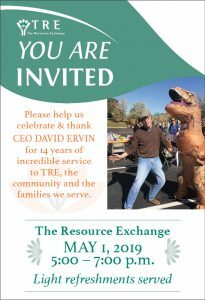 Twelve years ago this month, Dr. Ron Smith became the President of the Board of Directors for The Resource Exchange. As the Agency’s brand spanking new CEO, Ron was to be my partner in leadership over the next two years. Ron was smart, thoughtful and quietly passionate about TRE and the work we do. Relatively short in stature and bespeckled, he nevertheless intimidated the crap out of me! He was THAT smart, carried himself as a proper gentleman, and had been associated with TRE for years before I arrived on these shores. Those two years, as were the two that followed, were not for the faint of heart. 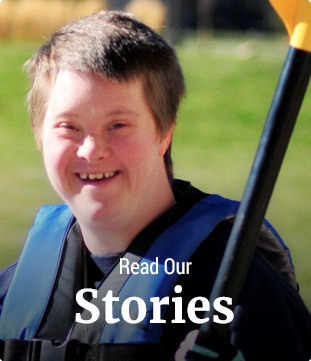 The Colorado system of services for people with intellectual and developmental disabilities would undergo paradigm-shifting changes that tested the system’s resolve and exposed fatal flaws that might have hurt the very people it was designed to help. For TRE, it was that and more. Shifts in funding mechanics laid bare a raft of unfunded mandates, which strained the organization’s financial resources. Throughout, Ron was a steady, calm hand at the helm. Seemingly never ruffled, Ron kept the organization pointed forward. He demanded unwavering focus on our mission and full, unrelenting dedication to the people we serve. That was, he would say, our ‘True North’, a beacon from which our gaze could not be stolen. Privately, Ron was patient with the new CEO, endlessly encouraging and always available. He went out of his way to ask about my wife and the boys, to urge me to spend time with family and relax outside of work in the pursuit of hobbies. Ron Smith, my mentor, collaborator and, dare I say, my friend, died May 24, 2017. He was 77. I miss him already. Perhaps exactly as it should be, I learned of his passing at the office. It was all I could do to keep it together long enough to slip into my office, quietly close the door so that I might cry at the news. I drifted back to those early years, hearing his encouragement and steadfastness, his wise counsel, his steady hand. Life is a miraculous journey. We are given the gift of encountering other people whose purpose is to touch us, to compel us to reach farther than we believe ourselves possible. And if we’re lucky, those people leave an indelible mark on us. Dr. Ronald G. Smith was just such a man. I am a better person for having known him, and I am forever thankful for having had that privilege. After our introduction – and an interminably long pause – we are back to Grasping the Nettle. And, in the spirit of Grasping the Nettle, we’re happy (we think) to offer our thoughts on the goings on in the US Congress related to healthcare and Medicaid reform. In full disclosure, our thoughts are not happy ones. The US House of Representatives’ version of the American Health Care Act (AHCA) will hurt people with intellectual and developmental disabilities (IDD). Badly. There’s no way to sugar coat this, and no amount of rationalization makes it better. The AHCA contains significant changes to Medicaid and how the federal government finances Medicaid services. Most of the rhetoric in the debate has focused on traditional healthcare. Far less prominent in the debate has been Medicaid-financed long term services and supports, the kind of services on which countless people with IDD rely. In fact, Medicaid is the primary funding source for nearly 80% of people with IDD who live in their home communities. As The Arc of the US puts it, these Medicaid-financed supports provide dignity to people with IDD by providing help with meals, bathing and dressing, toileting, in-home skilled nursing, and communication support, to name but a few. These supports can be the difference between life and death. Now enter the AHCA. As it stands, in federal fiscal year 2020 (which would begin in October 2019), Medicaid financing will change to a block grant structure, based on a per capita per state cap. Estimates of the total impact of this and related changes to Medicaid are as high as…brace yourselves…$900 billion. Yes, billion. With a B. Congressional Leadership has gone to great lengths to tell us the “States can make up the difference,” essentially shifting the funding obligation to the States’ discretion. As we Coloradoans know, any such scenario would first have to be taken to the voters as a tax issue (on the premise that to make up $14 billion in revenue losses from the fed, we’d have to raise taxes here at home.) And please forgive us being skeptical that Colorado taxpayers would be willing to tax themselves to this purpose. Knowing the Coloradoans with disabilities and older Coloradoans rely heavily on Medicaid-funded health insurance and long term services and supports; and, knowing that about two-thirds of Medicaid spending is on services for the elderly and people with disabilities, who comprise only about 25% of Medicaid recipients nationally, the disproportionate impact of the AHCA on Coloradoans with disabilities and older Coloradoans is clear. We believe we must act to protect life sustaining Medicaid benefits for people with intellectual and developmental disabilities. With thanks to our pals at The Arc of the US, see the major provisions of the AHCA. Educate yourselves. And then, as you may be inspired, speak your mind. Go Find your Representative and your Member of the Senate and share your thoughts. Remember, members of Congress ultimately work for us. They do listen. Make sure you make yourself heard. It seems to us there is plenty at stake and much for which we must fight. I’ve always found the notion of a blog somewhat amusing. To write a blog forces the writer to make a set of fairly sweeping assumptions, not least that people would be interested enough to want to read the writer’s musings. It takes a fair fit of confidence to make such an assumption. Or delusions of grandeur. Yet, blogs can be a fascinating way to engage people. And, they can offer a glimpse into different worldviews, which I believe is an opportunity to learn. On the premise that we can achieve those latter ends, I am delighted to welcome you to Grasping the Nettle, a blog dedicated to issues of importance to people with intellectual and developmental disabilities (IDD), their families, their support systems and its stakeholders, and to The Resource Exchange (TRE). 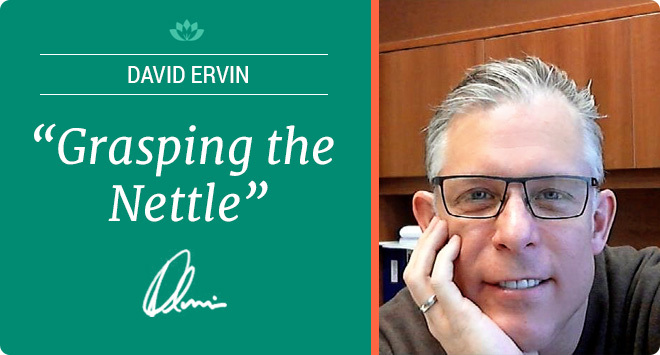 Our vision, a la Seinfeld, is a “blog about nothing.” IDD-related, of course, but otherwise random thoughts of those of us who find ourselves working with people with IDD. We envision guest bloggers—people internal to TRE and external. We envision guests who are found among our supporters, our stakeholders, our families…really anyone with an interest in IDD. My role will be a kind of blog moderator, as it were. I’ll write some, and leave the writing of others to others. We’ll not blog everyday—we’re unlikely to even follow a particular schedule. When issues of interest come up, we’ll write on it and invite our community to jump into whatever dialogue ensues. Mostly, we seek to use Grasping the Nettle as a means of engagement. That’s where you come in. See an opinion with which you disagree? Weigh in. Have a different take on an issue? Add it to the discussion. Want to see us take on a particular issue? Let us know. Let’s use Grasping the Nettle as something of a ‘chat room’. We all have opinions—so let’s exchange them. That will bring the blog to life, and that, my friends, is what we want! Watch this space for blogs to come. We’ll deal broadly with issues of importance, at least to us. There’s always lots to talk about, and we’ll seek to talk about stuff here. From employment to affordable housing; from healthcare to long term services and supports in Colorado; from the entirely intellectual to the unavoidably emotional; and, from this to that, we will introduce a whole range of hopefully interesting, informational, and inspirational issues. Stay tuned. 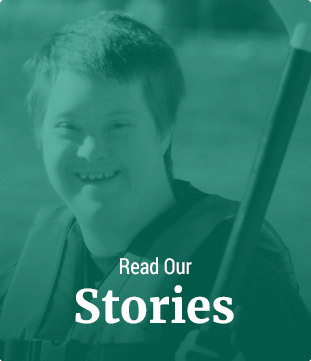 Our blog provides a forum for real-time information on the issues surrounding people with intellectual and developmental disabilities. We have created this blog as a safe place for dialogue (both online and offline) centered around the issues the intellectual and developmental disability community want to talk about. We welcome your comments, your thoughts on relevant topics that impact those individuals and families we serve.